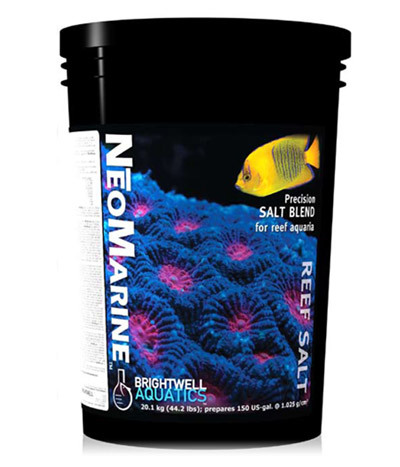 Brightwell Aquatics has just released their NeoMarine Reef Salt which is specifically designed to mix up as close to natural seawater as possible. The new salt is manufactured in Brightwell’s own in-house production facility which is a first; many of the new salts released in the American market in the last few years have come from one of just three marine aquarium salt production facilities in North America. Brightwell looked into having their salts produced by a third party but in the end they decided that the level of precision they were aiming for with NeoMarine required a level of quality control that could only be achieved by making the salt themselves. Brightwell also harps on the use of the highest grade of ingredients using no natural seawater evaporites. NeoMarine Reef Salt will be available in 50 and 150 gallon sizes as well as 300 gallon store use and 1,500 gallons for commercial applications. Pricing is $54.99 for a 150 gallon bucket on Premium Aquatics. The speculation that Seachem was working on a new salt for reef aquaria has now been confirmed. 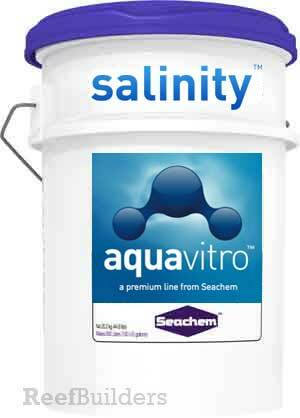 Seachem’s Salinity salt for reef tanks will be part of the Aquavitro premium line from Seachem. Salinity is said to the most concentrated salt available, manufactured in a controlled environment (we thought they all were) and the salt is optimized for use in aquarium conditions. The salt is not yet available for purchase but the first 12 buckets will be raffled off during the largest reef aquarium event this summer, IMAC West. For those of you afraid of having to carry home a bucket of the stuff, fear not because Seachem will be doling out coupons to the raffle winners who will then be shipped their prize of Aquavitro Salinity salt. More information can be had by visiting the raffle page of IMAC West and there’s a little blurb about Salinity on the front page of the Aquavitro website. Seachem's Salinity salt parameters can be found on the link provided.